CIT Relay & Switch offers the J104D Series general purpose relay. With bifurcated contacts, this relay is highly sensitive and low cost. The J104D conforms to FCC part 68 and is UL approved. The CIT Relay & Switch AD Series offers a complete switch solution for all your panel needs, including home keys. Long travel of 4.5mm (standard) for AD01 or shorter travel of 3.5mm on the AD02, actuation force of 250 +/- 50gF. Contacts with gold plating assure high reliability and long life of 5,000,000 operations typically. The CIT Relay & Switch A17 Series is a robust automotive relay in a small package. Noted for its high current/in-rush capabilities, the A17 offers plug-in styling with maximum current rating of 20A. 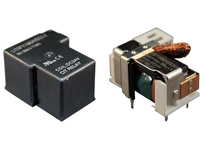 This sealed relay is single pole single throw with coil suppression options of resistor or diode. The CIT Relay & Switch RW Series rocker switch offers choice of double pole single throw or double pole double throw in eight different functions. Housing color choices of black, white and grey are teamed with fourteen different actuator colors, including five transparent colors for illumination options, this highly versatile switch can be customized to fit nearly any application. Illumination options include two tungsten lamps and two neon bulb choices. 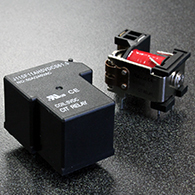 This UL/CUL recognized switch offers quick connect/solder lug termination. CIT Relay & Switch now offers two latching relays - the L115F1 Series with switching capacity up to 50 amp and the L114 Series, with switching capacity up to 16 amp. Both series are UL/cUL approved and can withstand heavy contact load with strong shock and vibration resistance. The L115F1 Series is a single coil relay and the L114 is available in both single coil and double coil. The CIT Relay & Switch Latching relays are UL F class rated standard and are ideal for energy smart applications. 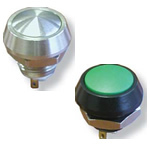 CIT Relay & Switch now offers the UV protected pushbutton DH Series in 22mm, 25mm and custom sizes up to 40mm. This IP65 panel mount switch line is heavy-duty and rugged in construction - both splash and vandal resistant. The DH series is available as momentary or latching in both SPST and DPST, normally open and normally closed. Flush actuator styles offer non-illuminated, bi-color ring illumination or dot illumination. Illumination color choices are Red, Yellow, Green, Blue, White and Orange. LED voltage choices range from 6V to 220V. 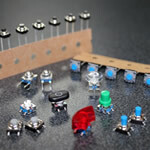 The Sealed Tactile Family of switches offers lighted, sealed, thru-hole, right angle and surface mount terminal options with a multitude of choices in cap styles, many of which are available with and without LED hole and several optional frames. Our versatile tact switches provide design engineers with several LED color choices. Bi-color choices make endless the combinations and applications for these popular switches. Non-lighted versions are also available with multiple cap and frame color combinations. 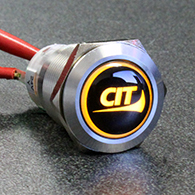 CIT Relay & Switch announces the addition of the ARL capacitive touch switch to our ever broadening product line. This switch provides an embedded capacitive touch slider functionality with multiple options and appearances. Options include an addition of a pushbutton switch, a vibration motor to provide feedback to the user and a timer for time-demand programs. The ARL Series is fully customizable. Contact CIT Relay & Switch today to start building your custom part number. Common applications for the ARL Series capacitive touch switches include audio/video equipment, automotive, lighting, instrumentation and appliances. 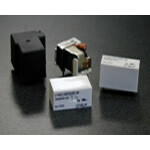 CIT Relay & Switch now offering the L115F1 Series latching relay. This newest addition to the CIT relay family is ideal for energy smart applications. The UL/cUL approved L115F1 is a single coil power relay that can withstand heavy contact load with strong shock and vibration resistance. 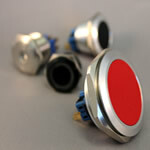 CIT Relay & Switch introduces the 12mm EH Series pushbutton switch. This newest addition to the CIT panel mount switch line is heavy-duty and rugged in construction - both splash and vandal proof. The EH series offers momentary switch function in a round style with a choice of rushed stainless steel or black anodized aluminum finish. Cap color options include five colors or stainless steel. The CIT Relay & Switch CL1200 Series offers a solution for your lighted switching needs. 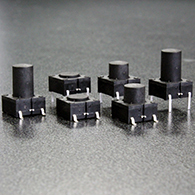 The CL1200 is available in both surface mount and through-hole construction, with an actuation force of 160 +/- 50gF and travel of .25 +/- .1mm. Optional RGB illumination. The CIT Relay & Switch SM3 Series snap-action switch offers choice a of single pole single throw or a single pole double throw circuit. This UL/CUL recognized switch is available in 0.110" quick connect, solder lug, PC terminal and right angle PC termination. The CIT Relay & Switch VM3 snap-action switch offers a choice of SPST OR SPDT circuit. These UL/CUL recognized switches are available in 0.187" or 0.250" quick connect terminals. As with all CIT switch product, our snap-action switches are RoHS compliant and include multiple gram force options and standard and custom levers.